Published: Saturday, October 8, 2016 I just got back from Madrid, where I attended the TECO-CIMO conference and the Meteorological Technology World Expo. Of course, we seized this opportunity to showcase the new Kipp & Zonen solar monitoring system RaZON+. We gave a poster presentation, we had a professional booth at the expo and we arranged two workshops. I hope every attendee returned home with RaZON+ on their mind. Last week was full of exciting meteorology. I was impressed by the many presentations at the conference and by the new meteorological products showcased at the expo. I found it amazing to see the various fields of physics used to get a high quality meteorological measurement. 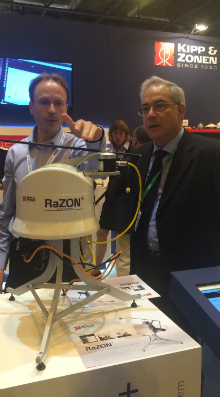 Meteorological Technology World Expo provided the perfect opportunity to present our new RaZON+ to the meteorological community. The all-in-one solar monitoring system measures direct and diffuse irradiance and calculates the global irradiance. At the expo we learned that the integrated data logger is one of the big advantages, but also the fact that it’s really affordable. As one of the team members of the RaZON+ project I have been deeply involved in the development of this innovative measurement system. I was responsible for the physics of the system; such as its pointing accuracy, the data analysis and comparison, and the physics of the detectors. I summarised my research and submitted my abstract for the TECO-CIMO meeting. It was accepted and that’s how my poster presentation found its way to the conference. The new systems’ performance was established by a comparison of RaZON+ with two systems of similar performance class and a Kipp & Zonen reference system on a roof-top in Almere, the Netherlands. The results of this comparison were showcased at the conference with a poster presentation and during the workshops. The report on my research approach for the poster presentation given at the workshop is now also available for download. 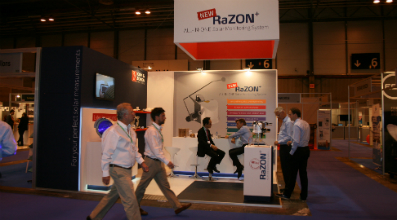 Next to visiting the conference, I also travelled to Madrid to give two workshops on the RaZON+ at the Kipp & Zonen booth. During these workshops enthusiastic potential customers, but also those that already purchased the system, were given a tour of the connectivity, software, data products, performance and more. It was a real dynamic workshop and the attendees came from all over the world, such as from Indonesia, Norway, Colombia, Brazil and Brunei for example. They all took the time to learn all about RaZON+. It was exciting to see the very positive reactions to our new product. With the positive feedback and the conversations at the exhibition, I returned to The Netherlands, full of new ideas for future innovations. I am very much looking forward to the MTX next year in Amsterdam. Blog written by Marc Korevaar, Physicist at Kipp & Zonen.